This hotel is 100pct non-smoking. Located in the heart of *Gator Nation * the well-appointed Hilton University of Florida Conference Center Gainesville hotel is on the Southwest corner of the University of Florida campus. Our hotel combines our mastery of meetings with an IACC Conference Center the perfect spot to blend the excitement of SEC sports and higher education. Hilton University of Florida Conference Center Gainesville hotel guests will enjoy a wide range of amenities including internet access complimentary 24-hour connectivity center relaxing outdoor pool and spa fitness center featuring Precor equipment room service full-service restaurant Shula*s Steakhouse and No Name Lounge. Featuring an IACC Conference Center our meeting and banquet facilities cater to business and social events of every size. 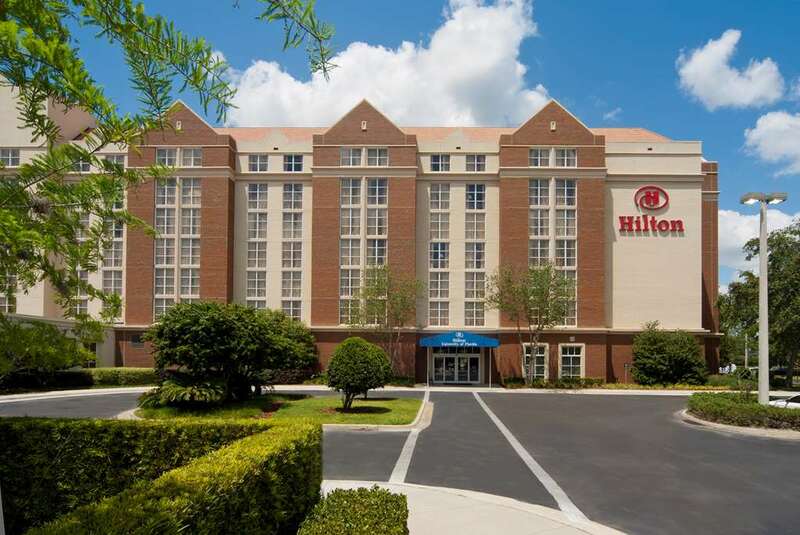 Hilton University of Florida Conference Center Gainesville hotel offers over 25 000 sq. ft. of meeting space and 12 meeting rooms with a variety of flexible sizes and configurations. Our beautiful Century Ballroom is an impressive 6 860 sq. ft. Take advantage of our on-property audio/visual company to meet all your needs a permanent registration area ergonomic chairs available upon request and the most accommodating Hilton Meetings Package. No Name Lounge: Enjoy a warm and pleasant upscale atmosphere for business or pleasure at our Gainesville hotel near UF. No Name Lounge overlooks our stylish outdoor dining Patio and swimming pool. Room Service: Breakfast in bed. Why not dinner and a movie in your room. The menu features salads sandwiches and full entrees as well as a complete beverage list to choose from. You*ve had a long day. Relax and let us do the walking.